AMHERST, Mass. 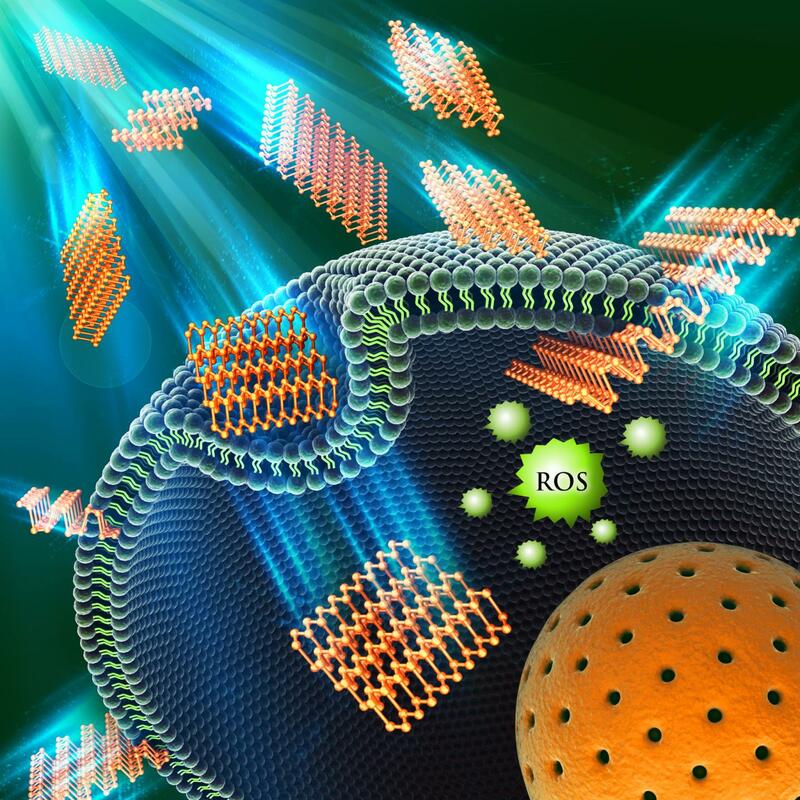 – When environmental and soil chemist Baoshan Xing at the University of Massachusetts Amherst began reading in 2014 that a new, two-dimensional material known as layered black phosphorous (BP) was gaining the attention of biomedical researchers for use in drug delivery systems and tumor photothermal therapy, he was both intrigued and concerned. "I am not only a soil chemist, but an environmental chemist," he notes. "As agricultural scientists, we are very familiar with phosphorous but I had never heard of two-dimensional black phosphorous. So we read all the nice papers about black phosphorous, and then, as environmental chemists, we started asking about nanoparticle toxicity. You have to be careful where you put such materials in the human body." In a recent cover story of the journal, Small, his former postdoctoral fellow, Qing Zhao, currently a professor at the Institute of Applied Ecology at the Chinese Academy of Sciences, and Xing report toxicity test results for different thicknesses of layered BP in three cell lines. Briefly, they found disruption of cell membrane integrity related to layered BP particle size, plus concentration- and cell-type-dependent cytotoxicity. Xing says, "We are among the first ones to work with this material, particularly in regard to its environmental implications." He and colleagues urge that "an in-depth understanding of BP's cytotoxicity is of utmost importance" to provide useful data for risk evaluation and safe biomedical applications. The researchers acknowledge that the new material, which is collected as thin samples from phosphorous crystals by a technique known as exfoliating, that is, shaving off layers of different thicknesses, does have "unique optical and electrical properties," which might make it "a promising candidate for an efficient drug delivery vehicle and photothermal/photodynamic therapy in treating a variety of cancers." Xing says, "I remember when single-layer graphene generated great excitement in the research community a decade ago, and I think people are getting excited now about a single layer of black phosphorous, that it might have many exciting applications." But the two materials differ a great deal in their single-layer structure, he adds, where single-layer graphene is perfectly flat, exfoliated BP has a zig-zagged structure. Zhao, Xing and their colleagues point out that studies of layered BP toxicity conducted to date have used viability reagents, which can interfere with cytotoxicity results. By contrast, they have used a label-free, real-time cell analysis (RTCA) technique that does not need any fluorescent or colorimetric viability reagents. Assaying layered BP toxicity in three cell types, mouse fibroblast cells (NIH 3T3), human colonic epithelial cells (HCoEpiC) and human embryonic kidney cells (293T), the UMass Amherst and Chinese research team found that layered BP's cytotoxicity is based on the fact that it generates reactive oxygen species (ROS). ROS are among the most potent cell-damaging agents known. Layered BP also disrupts cell membrane integrity in a particle-size-dependent manner. "The larger the BP is, less membrane integrity will be retained," they note. Further, they say the IC50 values of layered BP can differ by dozens of times depending on particle size and cell type. IC50 values refer to a measure of how effective a material is in inhibiting a specific biological function. Xing and colleagues urge that "special attention should be paid to the size of layered BP and the types of target cell lines for its application in biomedical field." They add, "Further study is undoubtedly necessary to explore the cytotoxicity mechanisms in depth," and that "given the results from our present study, the mechanisms of BP's cytotoxicity are strikingly complicated and have significant implications for the risk evaluation and safe biomedical applications of BP." They plan to follow up with further experiments to test their hypothesis that layered BP, with its unusual electrical properties, might prove useful in removing both positively and negatively charged chemicals and organic contaminants from water.